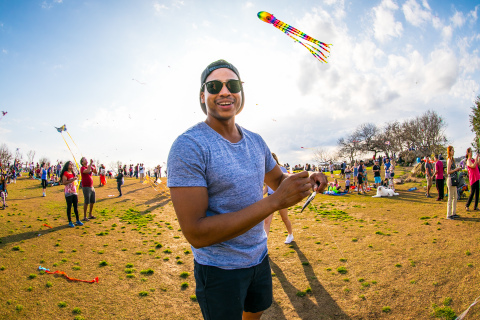 AUSTIN, Texas--(BUSINESS WIRE)--The ABC Kite Fest, one of Austin’s most iconic traditions, today announced details for its 90th year, returning to Zilker Park on Sunday, March 31. The festival welcomes more than 35,000 Austinites annually to watch as thousands of colorful kites soar over Zilker Park and to enjoy local eats and drinks, a kite showcase and contest, a children’s concert, a fun run, an all-new pet zone and more. Founded in 1929 by The Exchange Club of Austin as a kite contest encouraging creativity in children, the ABC Kite Fest is now the longest-running festival of its kind, underwritten by ABC Home & Commercial Services and produced by the Friends of the ABC Kite Fest, a 501(c)3 nonprofit. The Anteater Fun Run, presented by ABC Home & Commercial Services: The 2.1-mile run will kick off the festival at 9:30 a.m. The trail begins at the Zilker moontower and ends inside the ABC Kite Fest near the MossFest stage. MossFest, presented by Texas Mutual: MossFest, a children’s concert held in honor of John “Moss” Pieratt Jr., takes place from 10:00 a.m. to 1:00 p.m. inside the festival and features artists including the Barton Hills Choir, Que Pastas, Mr. Will and GRAMMY award-winner Dan Zanes with Claudia Eliaza. The Exchange Club Kite Showcase & Contest, supported by Cap Metro. With categories including the 50-yard dash and “most unusual kite” as well as expert flyers performing with professional-grade kites, the classic showcase and contest is open to the public from 1:00 p.m. to 4:00 p.m. and is free to compete with handmade kites only. For more details on categories and registration, visit the ABC Kite Fest website. The Kids Club, presented by St. David’s Children’s Hospital: Featuring bounce houses, face painting and more, the Kids Club is a day-long activity center for children of all ages. High Flyer Club: For attendees interested in VIP parking, all-day food options and more, the High Flyer Club offers designated parking spots and catered eats from Central Market. Tickets are available on the festival website. Pet Zone, presented by H-E-B: New this year, the H-E-B Pet Zone offers owners and their furry friends a special place within the park to enjoy the festival together, complete with dog-friendly activities including a swimming pool and sunning deck, agility ramp, three-ring jump, tunnel run and an enclosed puppy playground. Proceeds from the ABC Kite Fest benefit Communities in Schools of Central Texas and the Moss Pieratt Foundation. Cap Metro will also be offering free transit passes to Austinites to get to and from the festival. For updates and more information on the festival, tickets, sponsorship or vendor opportunities, visit www.abckitefest.org, follow the ABC Kite Fest on Instagram, like the festival on Facebook or download the new ABC Kite Fest app, coming soon to the Apple App Store and Google Play. Held each year in March, the ABC Kite Fest is one of Austin’s most beloved, family-friendly traditions. The festival boasts day-long activities for all ages, including the traditional kite-flying contest and showcase, a fun run, a kids club, a special pet zone and MossFest, a children’s music concert. Soar into spring and join thousands of Austinites for a free, all-day event filled with kite making, flying and gazing. For more information, visit www.abckitefest.org. ABC Kite Fest photos and graphics are available on request. The ABC Kite Fest, one of Austin’s most iconic traditions, today announced details for its 90th year, returning to Zilker Park on Sunday, March 31.